So I yearned to once again rip off the exercise I ripped off last year from the esteemed New York Times wherein their three main film critics each authored an essay in relation to a particular scene from a film that, so to speak, went home with them. I knew straight away what scene I wished to expound upon but, wouldn't you know it, Stephen Holden, of The NY Times, beat me to the punch. Kudos to Mr. Holden for finding as much depth and beauty and meaning in the same scene but, at the same time, piss on you, Mr. Holden, for stealing my non-existent thunder. I know, I know, I could write about it, too, (it really was the best five cinematic minutes of the year, at least for me) but that just seemed wrong and, besides, it did not take long to realize this whole event was a blessing in disguise for it allows me to expound upon my second favorite scene of all 2008, a scene that possesses plentiful amounts of beauty and truth despite its presence in (gasp!) a romantic comedy. 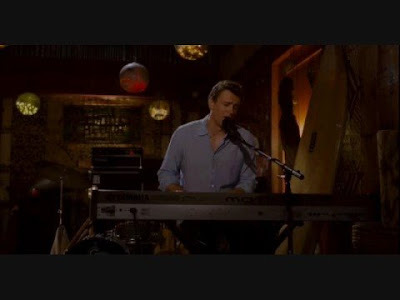 Peter Bretter (Jason Segel) has come to Hawaii to forget the Sarah Marshall (Kristen Bell) of the movie's title. He meets a comely young woman, as he must, named Rachel (Mila Kunis) who runs the front desk at the hotel where he is staying. They go out, sort of, to a beach party. They sit in the sand and discuss their life situations. Peter? He doesn't like his job composing music for the TV show of which Sarah Marshall is the star and yearns to write a musical....about Dracula....with puppets. But then Rachel's ex boyfriend appears. Things get ugly. Peter and Rachel leave the beach behind for a cozy bar. Peter returns from the bathroom to discover that Rachel has schemed to have the band playing depart the stage to allow him to play one of the songs from his musical. He takes the stage and hems and haws about how "out of context" the song might not make sense but Rachel, refusing to let him out of it, screams "Dracula musical!" (That line reading, by the way, might be the funniest thing in the whole movie. But that's another discussion.) Peter gives up. The bar goes quiet. He plays and then he sings. I've been drowning too long to believe that the tide's going to turn"
Rachel's face at first renders mild confusion. Perhaps it is Peter's variation of a Transylvanian accent. Perhaps she did not think he would be taking on Dracula from a first person perspective. He forges ahead. I'm still trying to shake off the pain of the lessons I've learned"
Still confusion, both from Rachel and the audience. But then Peter's voice grows more forceful. The Dracula-esque laugh wakes her up to the comedy and she laughs out loud, getting it....she thinks. how much I love you"
Now Rachel's face changes again. The laughter goes and so too does her smile, replaced with a sad, poignant look. She is touched. Now Rachel smiles again, but it's a sadder smile, a smile that feels something for Peter because she has realized that he is not really singing about Dracula but, in fact, about himself. I absolutely adore a movie scene that is able to accomplish two things at once and this sequence serves up two emotions simultaneously. I saw just about every Oscar-bait movie there was in December but you know what? None of them had any moments that touched me, that moved me to the very depth of my being, as much as Peter Bretter's lament at the piano. And, for sure, none of them made me laugh harder.